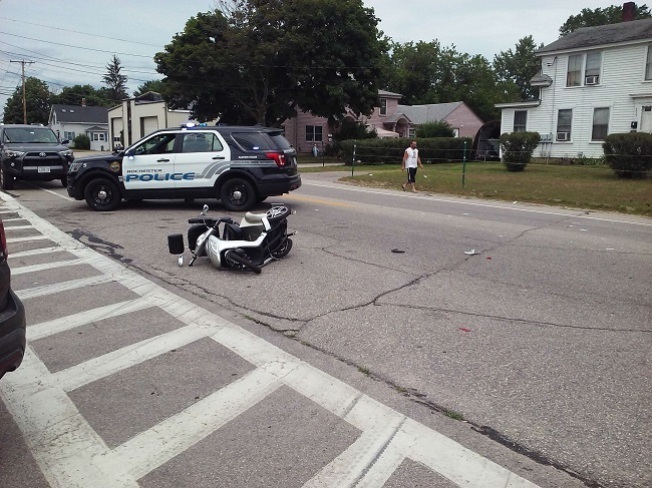 An elderly man suffered non-life threatening injuries Saturday afternoon after he was struck by a car in his motorized scooter. Edwin Lowell, 91, was traveling down North Main Street in Rochester, New Hampshire just after noon when he was struck by Donna Barden, 57, who was traveling northbound in a Toyota. Both the Rochester Police and Fire departments, as well as Frisbie EMS, responded to the collision. Lowell was transported to Frisbie Memorial Hospital. An initial investigation determined that Lowell was within a crosswalk at the time of the collision, but it is unknown if he proceeded into traffic from the sidewalk before seeing if it was clear and whether or not Barden had enough time to react. She is cooperating with the investigation. Anyone with information is asked to contact officer Joseph Oswalt at (603) 330-7128.